Denver Broncos fans grinned from ear to ear as we captured their moment with Todd Davis. TapSnap is no stranger to attending a large variety of events. From weddings to company holiday parties, our photo booth has always been a big hit at any occasion. This was no exception for Super Bowl champions, the Denver Broncos. They loved our photo booth so much, they bought it! These fans clearly had their priorities straight. Photo with Darius Kilgo first, chowing down second. 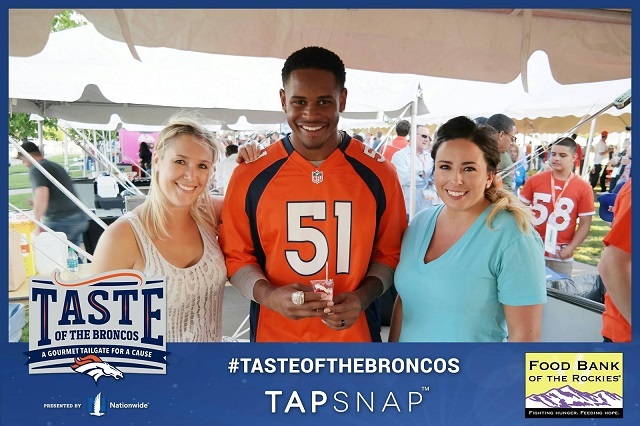 Earlier in June, TapSnap 1161 was invited to the team’s annual charity fundraiser, Taste of the Broncos. Not only did the team and attendees have a great time posing for pictures with our photo booth, our franchise partner also captured candid moments around the venue with our Social Photographer. These lovely ladies aren’t afraid to flaunt their team spirit! 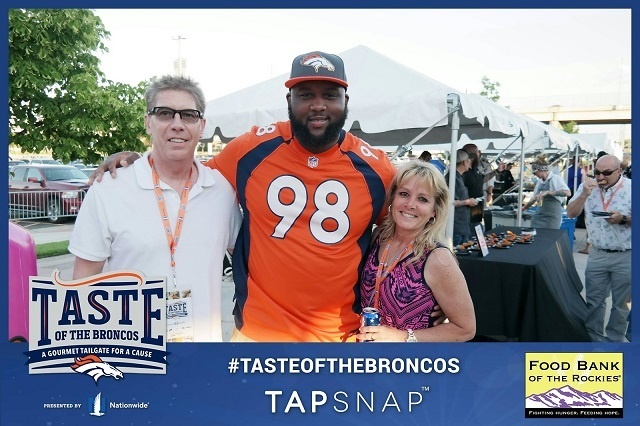 The NFL team couldn’t get enough of the TapSnap experience, so much so that they made our photo booth a permanent fixture at the Sports Authority Field arena by buying our TapSnap for Business kiosk. Their new fan experience feature is a great way for the team to further engage fans, and provides an added dose of fun to every game. Fans can instantly share their photos to social media to show off the fun they’re having at the game, while also showing their support for their favorite NFL team. 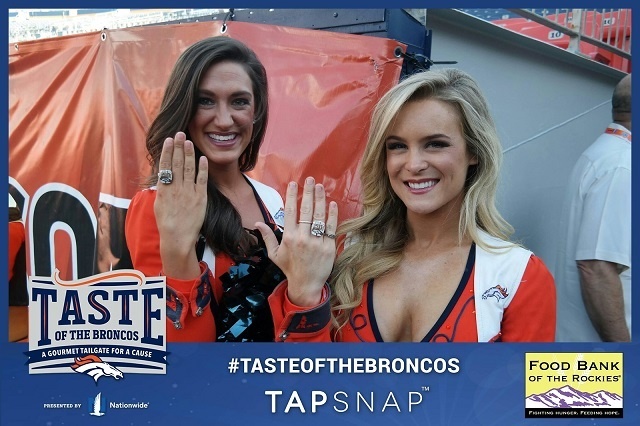 So, the next time you’re at a Denver Broncos home game, don’t forget to flash your pearly whites for the TapSnap camera! Needless to say, we’re beyond excited about our new partnership with the reigning Super Bowl champs! There will be plenty more photos to come, so be sure to keep an eye on our Twitter account, Facebook Page, and Instagram feed. Our permanent photo booth installation is a fun and effective solution to market any business. If you have questions, or would like to make it official, give us a call at 877-577-0566!